This manual came with a Pickett 400 slide rule and is in fairly good shape after being folded for 40+ years. The manual has instructions for a range of basic functions as well as for the specialist markup and business ratios. 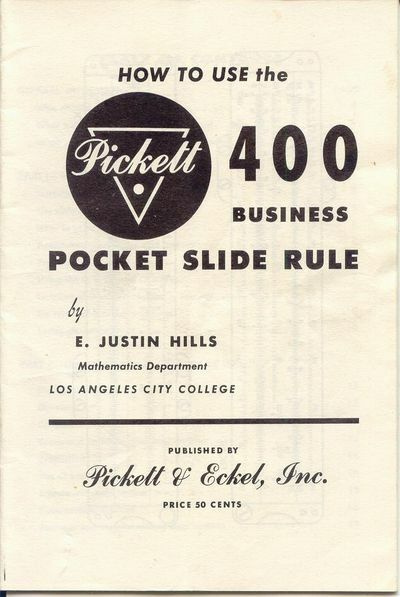 This manual is the same as another version I have except it is in a smaller format with a paper cover whereas the other is larger and has a cardboard cover, refer to this Pickett 400 manual. Copyright Date: Not listed but all illustrations are of pre 1950 type rules. 1 Who should use the rule? 2 What kinds of problems can be solved? 3 What mathematical background is needed?